The guys are packing up their equipment and Leonard finds a letter in the trash to he and Sheldon. It is from a scientific institute who wants the guys to present a paper they worked on together. Sheldon knows because he read it before he trashed it. Leonard wants to know why Sheldon didn’t show him the letter before he trashed it. Sheldon says he has no interest in giving the speech. Leonard wants to know what other awards Sheldon has hidden from him. Leonard says he is doing it. Sheldon says Leonard can’t do it because Sheldon is the lead author. Leonard points out that they listed names alphabetically and Sheldon says no he it was his idea and he was just throwing Leonard a bone. Leonard designed the experiment to prove the hypothesis. Leonard says he is doing it and Sheldon FORBIDS it. Leonard is going anyway. Penny is going through Leonard’s closet. He shows her a corduroy suit. She starts pulling things out of his closet and he asks if she wants him to try all of these on and she says no, just throw them out…don’t even donate them to charity, just throw them out. She hands Leoanrd a pair of pants and wants him to put the pants on. He is going to change in another room and she says just to change here, which throws Leoanrd but he does it. Penny wants to know if he and Sheldon can meet in the middle since currently they are not talking and Sheldon is staring at Leonard trying to make his head explode when they see each other. Leonard explains why they can not meet in the middle culminating his argument with Sheldon is bat crap crazy (My question is we know Sheldon is crazy but you live with him so doesn’t that make Leonard the bat crap crazy one? I think so!). Penny pulls out an outfit that Leonard explains is his original series Battle Star Galttica flight suit. Penny wants to know why he didn’t wear it on Halloween; Leonard explains (as if you need to explain more, I mean come on ORIGIANL BSG) that it is his Original Battle Star Galltica flight suit, it is not a costume it is a flight suit. Penny wants to know if this Leonard’s only tie and Leonard says no because it is reversible. Penny wants to know if he has anymore clothes and Leonard lets her know that this is everything since the 8th grade when he had his last growth spurt. They end up back to the corduroy suit. Penny is walking down stairs to check her mail and runs into Sheldon. He has his latest copy of Applied Particle Physics Quarterly. Penny says hers did not come. She waits for Sheldon to get it and then she lets him know it is a joke. Sheldon gives what we can kindly refer to as a laugh. Sheldon lets Penny know he is perfectly content to walk up the stairs in silence Penny ask Sheldon about his and Leonard’s little misunderstanding. Sheldon refers to Galileo and the Pope as having a little misunderstanding; he and Leonard are having a problem. Penny gently says Leonard is feeling upset that he and Sheldon are fighting; she wants to know how Sheldon feels. Sheldon doesn’t understand the question. Penny puts it another way and asks if it’s difficult to be fighting with his best friend. 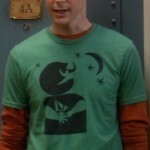 Sheldon hadn’t thought about it and wonders if he is having problems because of the fight. He uses big words to describe his problem and Penny responds-Huh? Apparently our hero couldn’t poop this morning. Penny says they should talk (AND SHE SHOULD HAVE STOPPED THERE!!!!) instead Penny tells Sheldon that Leonard said with out his little idea, Leonard couldn’t have come up with his experiment. Sheldon of course latches onto the word little idea and becomes angry all over again. Leonard comes out the door and Sheldon doesn’t ever want to speak to him again. Cut to Leonard coming out in his suit and telling Sheldon, he is leaving. Sheldon is still upset. Penny comes in all dressed up and wants to know if Leonard is ready to go. Leonard wants to know one more time if Sheldon will come. And Sheldon says NO. As they walk out Sheldon watches them puts his fingers to his temples and try’s to make Leonard’s head blow up. We cut to Penny, Raj and Leonard and Penny has made Leonard flip his tie as the other side was more stained (I love that the other side was MORE stained). Howard comes out. Apparently there are 25 people, which in the Physics world is Woodstock. We cut to Leonard saying in Conclusion and Howard taking a self portrait because Penny has fallen asleep on his shoulder. Leonard ask for questions and we hear a familiar voice ask what the hell was that? Everyone turns to look back and there is Sheldon. Leonard asks if there are any other questions. Sheldon stands up and tells the room who he is and walks to the front to stand my Leonard. He tells Leonard he skipped the most important part. Sheldon begins to tell a story of how he came up with the idea for this project. Sheldon and Leonard start verbally arguing that actual escalates to Sheldon trying to blow up Leonard’s head and the guys having a slap fight and then rolling on the ground. The camera cuts over to Howard holding up his phone, he Is obviously video taping. Penny wants to know is this how these Physics things usually go and Howard tells her she would be surprised at how often this happens. The guys gather around the computer and start watching. Penny walks in and wants to know why Howard’s Facebook page has a picture of her sleeping on his shoulder captioned “me and my girlfriend”? Howard says here comes the talk, and Penny just looks at him for a moment then puts her fingers to her temples and tries to blow up his head. The rest of the guys laugh, even Sheldon smirks. We cut to two Asian gentlemen watching a laptop, one is in a Greatest American Hero tshirt and the other is in a hoodie identical to the one Leonard wears (I believe these are suppose to be Sheldon and Leonard’s Chinese doppelgangers). We can hear the You Tube video of Sheldon and Leonard. The lights go on and off and they check and Walowizard in California is making the lights go on and off they high five and think things are AWESOME.